Photos distributed by the IDF show how Hamas uses children and teens to carry out terror attacks against Israel. The Hamas terror organization on Friday sent children and teens to carry out terror activities, the IDF said. Photos from Friday's "March of Return" on the Gazan border show a terror cell, including several young teenagers, attempting to ignite Israel's security infrastructure, while a second cell waits and drags the flaming infrastructure towards the border fence. 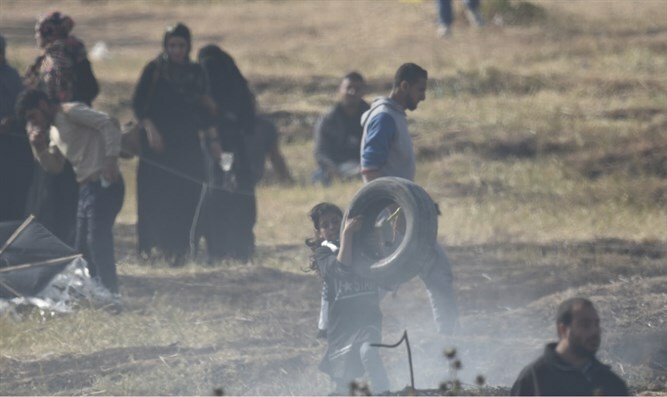 During the violent riots, rioters burned tires in order to use the smoke as a cover for their attempts to harm Israeli security infrastructure and carry out rock attacks against IDF forces. They also burned kites, releasing them to fly over the border fence and ignite fires in Israeli territory. "The IDF has a wealth of information on the intentions to carry out severe terror attacks while using the civilian march as a cover," an IDF spokesman said. "The terror organizations, with Hamas at their head, use civilians, including children and youth, to carry out various terror activities in order to harm our security infrastructure.